We're happier when we're accomplishing stuff, and we enjoy the rewards - whether it's a pat on the back, an acknowledgement in front of the team, or a pay raise - that come when we can be productive in our work. And we get frustrated when we face obstacles that stand between us and our productivity. Studies show us that leadership is one of the most potent factors in the workplace; that means that you, as team leader, can control a surprisingly large amount of what influences the productivity of your team members. Here are three surprisingly simple but effective ways you can help your team reach the higher levels of productivity that you would all like to see. We all deal with a constant barrage of data. We quickly become overwhelmed by the ability to connect instantly and globally. And we are handling all this data and connectivity under individual work loads and expectations that are increasing, rather than decreasing. Sometimes the biggest barrier to productivity is simply this too much. Too much of everything. Reduce the load of too much by setting limits. ●	Set a limit on meetings: how many there can be, how long they can be. Require that a single person be in charge of each meeting, and have a predetermined focus or goal for the meeting. Only the people directly involved should be in the meeting. Small, brief, and focused. ●	Limit the number of open projects your team members can be involved in concurrently. ●	Limit the number of deadlines. ●	Limit accessibility for you and for your team members. When access to you is limited, your team will learn how to power through, answer their own questions, and do their work without bringing every little question to you. When you help them limit their own accessibility, they are able to dedicate longer blocks of time to focused work, getting in the flow and getting things done. 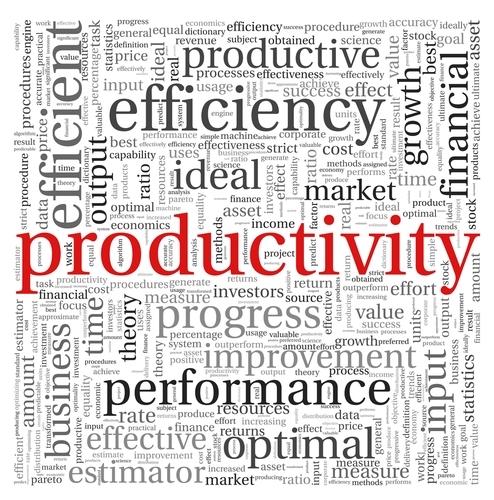 This not only results in higher productivity, it also makes for happier employees. Autonomy and freedom in the workplace are valued even above a higher salary or more resources. Your employees are happier and more productive when they're able to control how they work, what they focus on, and how they approach and solve the problems they're given. If you are in the habit of micromanaging, even if that habit comes from a truly genuine desire to help your team be productive, you are hindering their work. Micromanaging leaders are demotivating. Even if you trust and value your employees, when you micromanage them you are sending the opposite message. Micromanaging tells your team members that you do not think they are competent, capable, or trustworthy. Micromanaging tells your team members that you expect them to mess things up. Guess what? People tend to meet expectations placed upon them, both positive and negative. Micromanaging sets up a false dilemma, giving your employees the feeling that they have to do things perfectly or be punished. It doesn't matter if there is no actual "punishment." Just having a leader or boss notice a discrepancy, call out a mistake, or look over a shoulder continually is punishment enough. It makes your team feel like they backed into a corner, being asked to do their work with their hands tied behind their backs while you watch and criticize their performance. Reduced morale results in reduced quantity of work and reduced quality of work. And, of course, reduced job satisfaction. 3. Focus on results first. What are you really seeking in your business? What are your employees seeking? When you put the focus on results rather than hours clocked in, certain activities accomplished, or other arbitrary quotas, you can both reach your goals. Your team wants to do good work, reach goals, and know, at the end of the day, that they have accomplished something. But without autonomy and freedom in their work, they can't really take ownership of it. When they don't feel responsible for they work they do, it's impossible for them to truly enjoy the results of their labor. Even a great accomplishment feels like a non-event. But releasing the clamp and allowing your team to choose their own hours, activities, and methods for reaching the goals will allow them to work with autonomy and will allow you to see the right results reached. Is it better for an employee to make 75 cold calls and gain 15 new sales from that quota of calls, or for an employee to spend more time in research and preparation, make only 50 cold calls, but do it with such poise and confidence that you gain 20 new sales from those calls? Good results do not justify unethical methods, but there are a variety of legitimate and equally helpful methods possible to reach your team's goals. Give your team members the freedom to choose the methods that fit best with their style and they'll get better results.